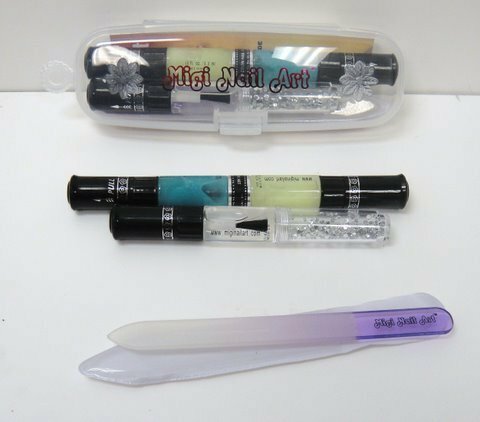 Buy migi nail art fingernail polish brush sets here online and get the hottest colors and trends in nail art design. These pass the test as a teen reviews the products. Migi nail art fingernail polish kits are great, they work wonderfully, last well and maintain their quality through use after use. My 13 year old bought a set this past summer and has created beautiful and creative nail art all through out the school year. They are still going strong, holding up to her intense usage. She now wants to add more colors to her collection. While we were picking and choosing from the hot new colors I thought why not share this with others. 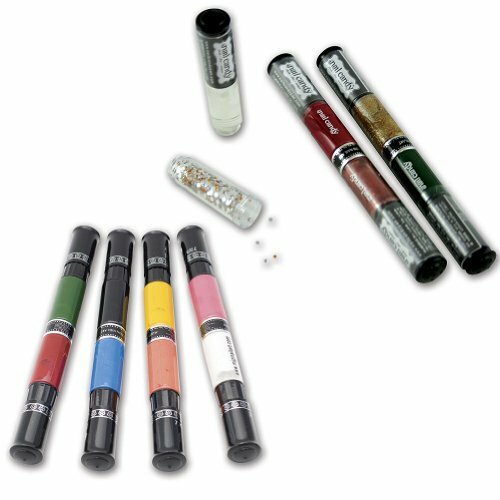 The Migi pens really stand up to some intense use, maintain the smooth consistency and glide on beautifully every time. My daughter bought her set of Migi nail art, of all places, at the state fair. We've looked high and low trying to find these cool pens to buy more. She's since gone online to buy more and found the Migi sets priced the best at the online retailer we're including on this page. My teen is a great artist and enjoys making all sorts of designs, one was a college rule paper theme, it actually looked like a sheet of college rule paper on her nails. This is so cool the designs and colors she combines is a big hit with all her friends. Since it's so hard to find them we had to build this page letting everyone know how great they are and where to get their hands on them. Check out these unique pens and brushes. First off this is the must have set to begin any collection as they have the trendiest poppin neon color favorites every girl loves. The unique migis have a pen on one end and a brush on the other. This cool feature allows you to brush on your desired base coat color, then create cool and amazing designs with the pen tips using as many different colors as you like. This set of limited edition colors comes in magenta, kelly green, hot pink, royal blue, deep purple, lemon and a fire red orange. The kit includes step by step instructions if you're new to the nail art craze. You'll pick it up in no time and be hooked like my daughter creating awesome nail art. Metallic colors are another hot color trend in nail art. You can create the hot animal prints with these awesome colors as well as many other creative nail designs. This set contains 8 shimmering gold tone colors. Add a professional look to your manicure with a set of 8 shimmering gold colors. Patented tip for precise, salon-quality designs. This is the kit my daughter is getting now. She has the others, this set is her must have as she see's great potential in this kit. She has ideas running through her head as to the new designs she will be doing once this set arrives. My daughter does my toe nails, I love the fun designs and they last for weeks and weeks. In fact I wear them till she talks me into a new design. They are all such creative works of art I have a hard time getting rid of them. The migi nail art designs last through a lot of wear and tear. This set is a bonus adding rhinestones to the creative nail art mix. This is another must have according to my daughter. This set includes 1 pen with two colors, one at each end, glow and turquoise, 1 rhinestone pen and 1 crystal nail file. Bottom line is this is easy to do and fun to create endless designs uniquely your own. These migi kits create the perfect pretty feet for summer sandals and bare foot at the pool. 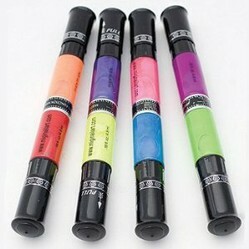 Each color has both a brush to sweep on color and a pen to draw and create designs. To use the nail portion you gently squeeze a bead of polish from the pen tip and draw to your hearts content. The pens work great, never dribbling polish but always making smooth clean lines allowing you to create intricate detailed nail designs. This is a must have set for the serious artist. These amazing long lasting nail lacquer art brushes are for the serious minded nail artist. My daughter has created some amazing nails with this awesome product collection, This is great fun for parties, sleep overs as teen girls will create endless designs. So if you want to really blow your daughters mind, and get some amazing nail art for yourself, this is the nail art kit for you. SimplySara is a new Wizzley author who's off to a great start with this her firs Wizz. I was so impressed with her page on do it yourself nail art I just had to share. Without further ado I give to you an amazing do it yourself with some fascinating tips even this old nail pro found both helpful and inspiring. SimplySara, Oh my you are so going to love the migi nail art pens they make it effortless to draw anything on your nails. The quality of this product is amazing, my daughters and I love it. I am SO into nail art these days. I had not heard of these tools before! Thank you so much! samsara, My daughter has the entire Migi nail collection and she creates some amazing designs. I don't have to go out to get my nails done as she's always happy to do them for me. Angel, The migi nail art pens have stood the test of time by my daughter and I who show no mercy when testing a new product. I didn't expect them to pan out but they did, they are awesome pens and last maintaining their original quality. They are so sturdy you can even refill them yourself... the pens and brushes are great quality. Have never seen these before now. Thanks for sharing. Will have to get some of these for my girls and me of course. Katie, I love these. I have been seeing the neatest nail creations on checkers when I'm shopping and also on the Internet. I'm going to take a look at these and maybe buy a set next month. The budget is shot this month. Thanks for letting us know all about them. Thanks RealHouseWife, Much appreciated and great having you here. This migi nail kit is a big hit as you said mani pedi's a huge hit at sleep overs. :) I have two daughters as well, they have a blast, makes for great photo opts to, priceless memories. haha! Ok you know I am new on Wizzley - so I just Pinned this as my first time trying it - it looks beautiful on my board and worked perfectly:) I love it! I love your Wizzley style too! !